If you’re into the African/ Bushmen theme in your home, then this is perfect for you. These cuties all look like they came from that African tribe, fighting off lions and hunting antelopes. All three heads are small, made of red clay, which, when baked, turns chocolate brown (that is why they look kind of tasty, too). They have red clay necks, which also resemble African neck decorations. 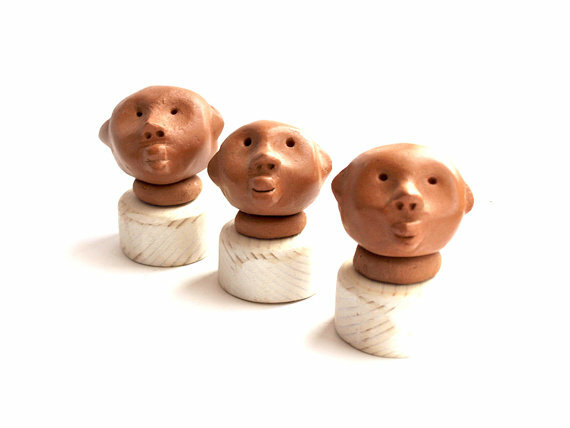 The heads are placed on wooden pedestals, slightly smoothed and left in their natural color and texture. The art pieces are perfect for an awesome addition to your personal collection or for a present for someone very special.